Thousands of Twitter users resurrected a farcical conspiracy theory on Saturday, once again flooding the social media site with memes and jokes about #FakeMelania. 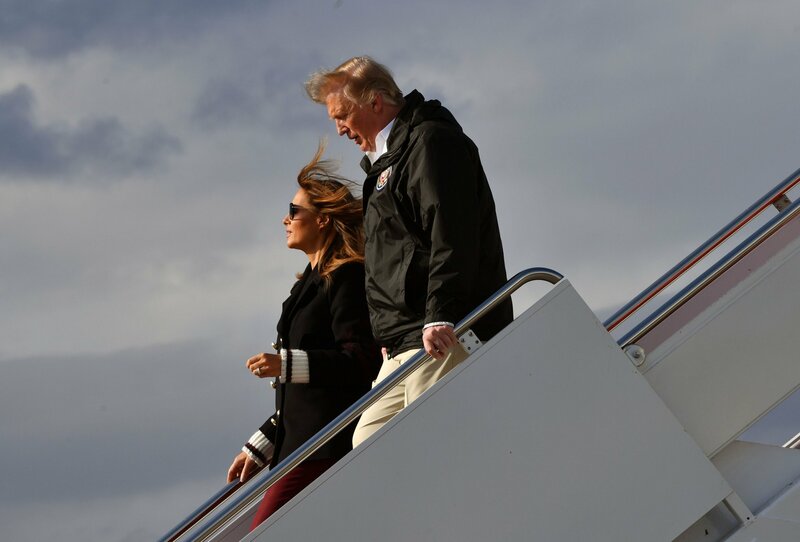 This time, the comments came pouring in after pictures emerged of President Donald Trump and First Lady Melania Trump in Alabama, where the pair were visiting Tornado-ravaged communities. More than 35,000 tweets helped propel #FakeMelania to a leading position on Twitter Trends by mid-afternoon. The site was awash with wisecracks about the baseless theory, which posits that the former model uses a body double to skip out on public life next to her husband. The claim has been floating around the underbelly of the internet since at least 2017, mostly fueled by internet users who take it upon themselves to analyze her mannerisms and other minute details about her appearance. The conspiracy last found a wide audience in 2018 and focused on a few grainy images of Melania Trump leaving Air Force One after the plane touched down in Brussels. In that case, the hashtag #WheresMelania began picking up steam on leading social platforms. Typically, the trend finds renewed life whenever Melania Trump is pictured wearing sunglasses or whenever an especially grainy photograph of her emerges, Vox reported. The origins of viral memes can be hard to trace, but this nutty claim appears to have been birth into the online world after Twitter user Joe Vargas shared a video of the First Lady standing near Trump as he gave an impromptu speech in October 2017. In the clip, the president makes a reference to his “wife Melania, who happens to be standing right here" — an odd utterance that was enough to send clusters of conspiracists running for their foil hats. "This is not Melania," Vargas, who has roughly 80,000 online followers, tweeted at the time. "To think they would go this far & try & make us think its her on TV is mind blowing. (sic) Makes me wonder what else is a lie." The post garnered more than 100,000 "likes" and another 60,000 retweets. Google searches such as “Melania Trump double” and “Fake Melania” spiked online following the viral tweet. True to form, online merchants soon capitalized on the trend and began selling t-shirts emblazoned with #FakeMelania and other such references. The wild rumor got so popular that a spokesperson for the first lady felt it necessary to splash cold water on the long-simmering joke. "Once again, we find ourselves consumed with a ridiculous non-story when we could be talking about the work the first lady is doing on behalf of children, including the opioid crisis that is gripping our nation," East Wing communications director Stephanie Grisham told CNN the October statement.